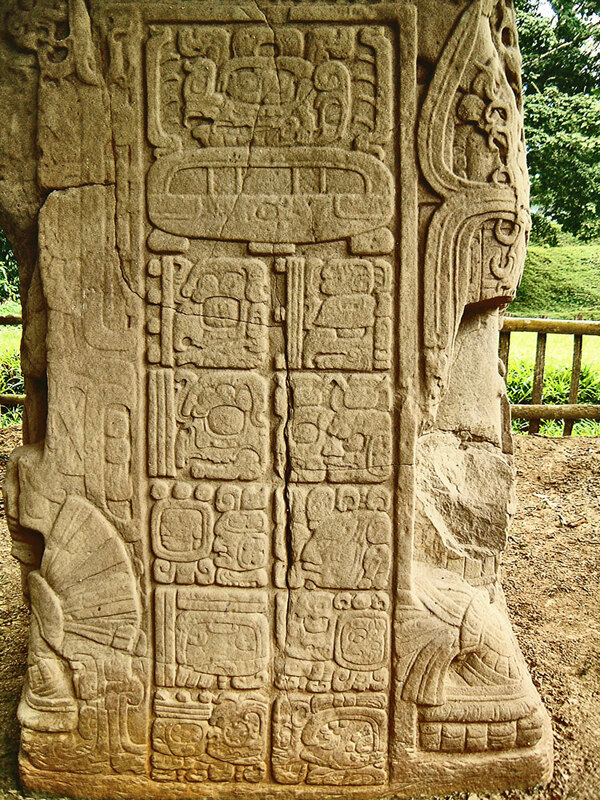 This is a close up of the glyphs on the right side of Stela K at Quirigua. Ancient Alien theorists would almost certainly take an interest in the motif at the top! However, this flying saucer is the Mayan emblem that precedes a date and this is the glyphic text that provides the date for the monument. The glyphs are read from left to right, starting from the top, with the pictures denoting the period of time (years, months, days, etc), and the dots (equalling 1 each) and vertical bars (equalling 5 each) providing the quantity of those periods. For example the top left is 9 B’ak’tun – approximately 3546 years, as each baktun roughly equals 394 years. This is followed by 18 Katuns – about 360 days, and so on. The full text (click here to view) provides a date of 9.18.15.0.0 3 Ahau 3 Yax, which equates to the 22nd July 805. Find out more in the article The Stelae of Quirigua.